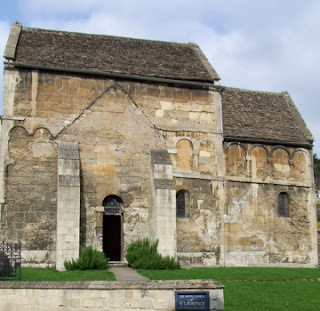 While we’re on the subject of Anglo-Saxon buildings, here’s one more Saxon church, the remarkably well preserved St Laurence, Bradford-on-Avon. Its date is uncertain. Documentary sources refer to a church in Bradford as early as the 8th century, but St Laurence’s looks more like a 10th or 11th-century building, and the best guess is that it was built in 1001 to house the relics of Edward the Martyr, who had been killed at Corfe, Dorset, in 978. 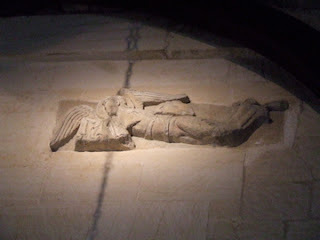 Edward’s remains were originally kept at Shaftesbury Abbey, but scholars think they were moved to Bradford in 1001, possibly because this was a site less vulnerable to Viking raids, possibly to remind those who venerated the Northumbrian martyr Oswald (whose shrine was also in the region, at Gloucester) or the Mercian Saint Kenelm (whose remains were at Winchcombe) that there was also a Wessex martyr who was worthy of veneration. This little building was no longer a church in the 18th century. It became a workshop, and then was converted for use as a schoolroom and cottage. But it was ‘rediscovered’ by a Victorian clergyman and restored, and has survived its first millennium in very well. Its tall, narrow proportions, tiny windows, and narrow, round-headed doorways are all typical of Anglo-Saxon buildings. So is the way the walls are decorated with narrow strips of stone, called pilaster strips, forming a series of arch-shaped panels. 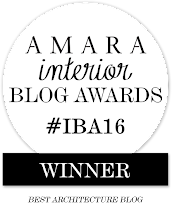 The interior is small, plain, and rather magical. High up on one wall are two carved stone angels, beautiful pieces of relief carving that may have originally formed part of a crucifixion scene, a fitting climax to a remarkable building. You can read more about its archaeology, history, and architecture here. 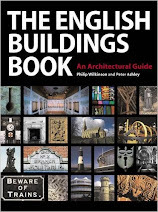 Here is a hidden marvel, a gem of Anglo-Saxon architecture that is familiar to scholars of the early history of English buildings, but not well known to non-specialists. It is the crypt of St Wystan’s church, Repton, a building with a history stretching back to the 7th century. It’s quite unusual for a parish church to have a crypt. You usually find these underground spaces beneath large cathedrals, where they housed sacred items such as the remains of saints. Parish churches didn’t often run to such precious relics, but monasteries sometimes did, and the church at Repton began as a monastic church, and an important one, that became the burial place of the kings of the Saxon Midland kingdom of Mercia. King Ethelbald of Mercia, who died in 757, was buried here; so was King Wiglaf (died 840). When Wiglaf’s grandson Wystan was murdered, he was laid to rest here too. When Wystan was canonized, Repton became a place of pilgrimage. To house these hallowed remains the Saxon masons built a crypt about 16 feet square. 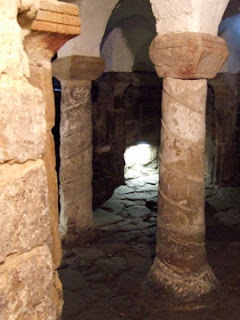 The crypt was probably first constructed in the 7th century, but was rebuilt in the 9th century, when it took the form that it still has today – a square space with a vaulted ceiling held up by four columns, each made from a single stone and each encircled with decorative spiral bands. It’s quiet, dark, and small, but there would have been space enough for the royal tombs and the saint’s shrine, and there are two staircases so that pilgrims could file down one and up the other, in a steady one-way traffic of devotion. It’s well known now how in the early decades of the 20th century London Underground’s (later London Transport’s) head Frank Pick changed the face of London’s transport network by presiding over a ground-breaking redesign. A new typeface (designed by Edward Johnston) for the signs, the improved ‘roundel’ symbol (also by Johnston), the diagrammatic and wonderfully clear tube map (which, in its latest incarnation, still guides us around), and a remarkable series of new stations serving newly developing suburbs from Sudbury to Cockfosters were among the results. The stations brought a very special version of modern architecture to London. It was the time when Le Corbusier’s work was becoming well known here and the Bauhaus was bringing a new rigour to design in Germany. 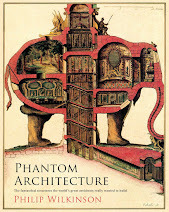 But Frank Pick, and his architect Charles Holden, looked farther afield for inspiration. They were taken by the work of Scandinavian architects, especially Swede Gunnar Asplund, whose public buildings combined Classical proportions with an awareness of modernism and a winning use of brick. This Scandinavian influence, combined with Holden’s genius for massing and his way with materials produced a series of outstanding station buildings, the most famous of which is Arnos Grove, recently celebrated by the Guardian. 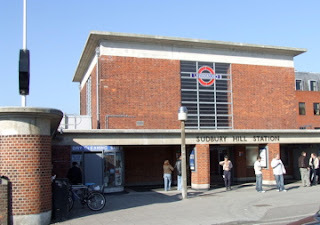 Here’s one of the less well known examples, Sudbury Hill, built in 1932. It’s a happy combination of concrete and brick, straight lines and curves, window and wall. Johnston’s letters are still announcing the name clearly, Holden’s generous metal-framed windows are still lighting the interior, and the station is still streets ahead of the dull imitation of a brick, mansard-roofed terrace that has sprung up to the right. Buildings like this, modern and friendly, spacious and clearly signed, get as near as one can to making real the dream of mass public transport that’s a pleasure to use. 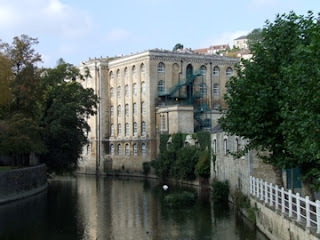 The rubber factory at Bradford-on-Avon, designed by Richard Gane, takes a different approach. For a start, delightfully in this stone town, stone was used for the walls. So the building conforms to the town’s honey-coloured palette – not that a structure this size would do anything as unassuming as blend in, but the colour helps. More than this, though, the building gets its character from a pleasingly eclectic mix of design features: a Classical looking cornice and, of all things, pointed, Gothic arches. It shouldn’t work really, but it does. It seems right in a town in which a Saxon church jostles with Jacobean houses and Victorian factories – a feast, in fact, for the building-fancier. I hope to return soon. 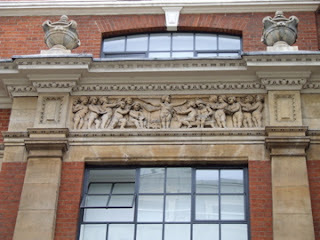 High above Hollen Street, in one of Soho’s unregarded corners, a group of putti are making music. It seems a strange decoration for this otherwise industrial-looking building in a Soho side street. But this plaque, and another up the street that depicts putti churning out pages on a printing press, are a clue to the building’s origins. This was the printing works of the music publishers Novello’s, just around the corner from their offices (now Chappell’s) in Wardour Street. Both these buildings were designed by Frank L Pearson, who was the son-in-law of the company chairman and the obvious choice for the job. The printing works came first, in 1898, and were followed in 1906 by the offices, all in brick with stone dressings. The office building has a beautiful small concert room on the first floor, done out in the style of a 17th-century hall – the kind of oak-panelled room you find in a country house or Oxbridge college of the Commonwealth period or just after. It’s not normally open, but can be glimpsed, often lit up, from the comfort of the pub opposite in Wardour Street. Among the neon-lit media offices and restaurants of Soho, the concert hall and the charmingly decorated printing works form a throw-back to another time. ‘Northamptonshire for spires and squires’, says an old proverb, and Northamptonshire spires don’t come any more beautiful than this one at King’s Sutton, near the border with Oxfordshire. Its delicate, almost lace-like details suggest that it’s probably late-14th century, and although it was restored in 1898 it’s likely that it looks very much the way it did when it was built. The pinnacles, flying buttresses, and openings are classics of their kind. 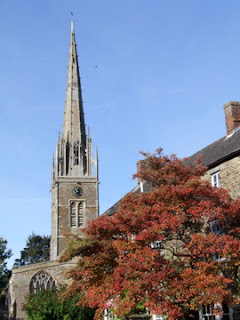 Pevsner’s Buildings of England volume on Northamptonshire calls it ‘one of the finest, if not the finest, spire in this county of spires,’ and it’s easy to agree. Pevsner was not the only admirer of Northamptonshire spires. The Victorian architects who revived and developed Gothic church architecture used them as models of their churches. Many of these designers especially admired the Gothic of the 14th-century – they called it the Decorated or Middle Pointed style – and ‘Northamptonshire’ spires can be seen above the terraces of London and between the mills of Yorkshire towns. Can a man desire more? There ain't such a town in twenty. 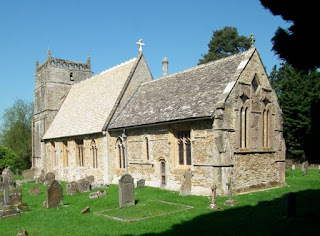 Hats off to the inspiring churches and villages of Northamptonshire. This small surprise is tucked away in a side-street in the Wiltshire town of Melksham. 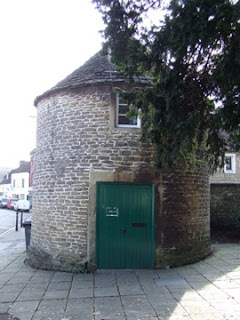 It’s an 18th-century structure, built, Melksham being a wool town, as a wool-drying room. When the wool trade declined in the 19th century many such buildings were no doubt demolished. But this one survived, playing down the years a multitude of roles – armoury for the local volunteer militia, feed store, business premises, tourist information centre, and museum. England has many specialized structures like this, the often odd-shaped remnants of local industries – oast houses and lime kilns come to mind. Often they seem designed so precisely for their original function that adaptation appears impossible. But with a little imagination, many of them have been recycled to the delight both of their users and of passers-by. 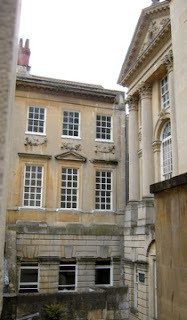 Just visible through a gap between buildings, to the rear of North Parade Passage in Bath is the grandiose town house of Ralph Allen, a man who had a huge influence on the development of the city. Allen was Bath’s postmaster, but his main claim to fame is that he bought Combe Down quarries, a principle source of Bath stone. Allen marketed his stone effectively. He installed a wooden railway and was involved in making the River Avon navigable so the stone could be transported more cheaply. Bath builders bought the stone enthusiastically and soon new houses clad with this beautifully creamy material were appearing all over the city. Allen bought the lease of this house in 1727 and straight away began to improve it. Both the flat-topped façade to the left of the picture and the much more elaborate free-standing extension to the right were built for him, perhaps by premier Bath architect John Wood the Elder. The carved pediment, huge Corinthian columns, and big, round-headed window of the extension make up an inspired bit of infill, which you can see if you peer through the space between the adjoining structures. They don’t take any nonsense in Dorset. You damage this bridge and you’re out, understand? It’s been here since the 16th century and we want it to stay that way. Not that there’s any room for misunderstanding with all this typographical shouting (‘guilty of FELONY’, ‘TRANSPORTED FOR LIFE’), which reminds one of the barely suppressed menace of old income tax forms (‘if you are a MARRIED MAN’). It all looks like zero tolerance, a century before anyone thought of the term. I don’t think they’ll put you on a slow boat to the antipodes any more if you damage this bridge, wilfully or not. But you’d better behave. Just in case. OK? 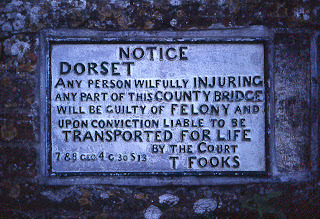 Many thanks for the picture of the bridge sign at Wool to Peter Ashley, who blogs about England’s glories and eccentricities here.